A guy at a restaurant once told me that stupid animals taste better (something I was inclined to believe because this guy looked like he was speaking from a vast background of personal experience) which is a rule that certainly holds true for the ostrich, an exceptionally stupid and delicious animal. Unfortunately, ostrich is about as expensive as it is delicious and so I generally only cook it on special occasions like the holidays ... or 1/2 off sales on ostrich meat. Cut the ostrich into steaks of roughly equal thickness and season with steak spice. This step is essential because the high density and low fat content of the meat make it nearly impossible to grill to an even doneness unless it`s all the same size. Place the ostrich steaks on a very hot grill or grill pan and cook until the centre reads ~140F on a meat thermometer, about 6 minutes per side. I use a meat thermometer because the dense meat is very hard to test by touching as you would with beef. 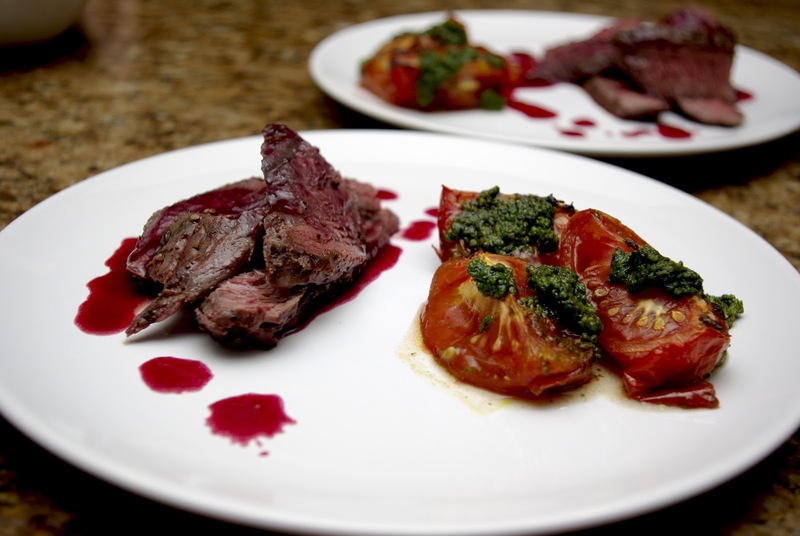 While the ostrich is cooking, melt 1 teaspoon of butter in a sauce pan over medium high heat and add berries. Toss the berries in the butter and sautee for a couple of minutes until they start to turn purple in colour. Add in the stock, reduce heat to low and simmer, half covered, until liquid is reduced by half. Remove from heat. When ostrich is done, remove from heat, cover and let to rest for 5-10 minutes while finishing the sauce. To finish the sauce, strain the berries through a fine mesh strainer into a saucepan, working the fruit with a spoon to extract as much juice as possible. Bring strained juice to a simmer, stir in remaining butter and remove from heat. When butter has melted in it will give the sauce a shimmering, silky texture. Slice ostrich thinly and drizzle with sauce and serve. Because it is so lean, this dish goes really well with risotto which adds some richness. It's also great with smoked or roasted tomatoes.